Windows runs really well, even on my lowly little MacBook. I did bump my memory up to 4GB, which I think is really important, but standard Windows applications (not games mind you – not even attempting that on a MacBook) work great. To maximize screen real estate – really important on a MacBook – I run Windows XP in full screen mode. This still allows me to access spaces easily. I was able to get Visual Studio 2008 Express installed without any problems. Early in the setup VS08 rebuilds much of it’s library, so it’s a chance to see the impact it has while running full bore. On my machine during peak compile times the CPU ran a steady 50% utilization. I jumped into other Mac applications, including Safari while it was working and experienced no noticeable degradation in performance. Once I had VS08 up and running it ran really smoothly. I didn’t stress it too much – just a couple of browser based applications – but it was able to load them up in IE and I could run through the debugger just fine. During these minimal tests the CPU barely broke a sweat. 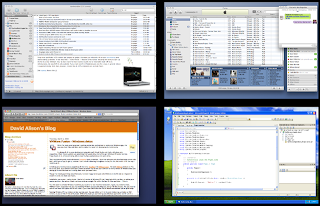 To give you a sense of what’s possible to run on a little MacBook, here I am using Spaces to run NetNewsWire, iTunes, iChat, Safari and finally a full screen Windows XP (lower right) with Visual Studio 2008 Express Edition loaded and running. What’s great about this is that I can rapidly switch between environments. Windows performance – even in a VM – is snappy. I notice a little window "tearing" when dragging windows quickly. I think that’s probably a function of the way graphics are handled on a MacBook – no dedicated video card. The MacBook Pro does have a dedicated video card so it may not have this issue. One thing I have noticed with the MacBook is that I do take a pretty decent CPU hit when viewing flash based sites. It’s not nearly as bad with QuickTime video (interesting, huh?). When I speak to friends that have iMacs or Mac Pros they don’t see any CPU hit when watching Flash based stuff. Based on the results I’ve had I think I’m going to try loading up VS05 with my current product build into a VM and see what the performance is like. My project has gotten pretty large and uses some aftermarket controls for UI, so it will be a good test. I also am debugging my application using SQL Server Compact Edition so it’s a pretty tall order. On my Windows XP development box – a beast of a machine with an EVGA 680i mobo, Intel QX6700 processor, EVGA 8800GTX video and matched Corsair memory I take a significant CPU hit when VS05 decides to refactor my code while using certain design surfaces.